Earlier this month, major Arab countries led by Saudi Arabia severed diplomatic ties with Qatar, accusing it of financing and sheltering terrorists and maintaining cordial relations with Iran. Doha's pro-terror policies have not only made the Middle East more unstable, but also directly threaten Israel's security. For the past decade, Qatar has provided financial and diplomatic support to the Palestinian terrorist group Hamas by hosting its leaders and pledging millions of dollars to the Hamas-run Gaza Strip. Qatar also sponsored platforms to campaign for the global Boycott, Divestment, Sanctions (BDS) movement aimed at economically isolating Israel to end its alleged "oppression" of Palestinians. An IPT investigation has found that senior academics tied to a Doha-based think tank believed to be financed by the Qatari government and its Washington, D.C. affiliate routinely engage in anti-Israel rhetoric and are strong BDS supporters. 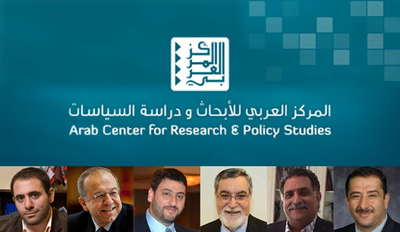 Osama Abu-Irshaid, a non-resident scholar at the Doha-based Arab Center for Research and Policy Studies (ACRPS) was a featured speaker at a three-day international conference in Tunis in August hosted by the center to discuss boycotting as a means to combat "Israeli occupation." The conference, "Boycott as a Strategy against Israeli Occupation and Apartheid: Present-day Realities and Aspirations" described BDS as "an indispensable method in the struggle against Israeli oppression" and sought "to better understand its importance and the best means by which it can be bolstered." The BDS movement touts itself as "a Palestinian-led movement for freedom, justice, and equality" that uses a strategy of boycotts, divestment, and sanctions to challenge "international support for Israeli apartheid and settler-colonialism." But the strategy appears to be backfiring as its unintended victims are Palestinian workers and the Palestinian economy. Abu-Irshaid is also national policy director of the pro-Hamas and anti-Israel organization, American Muslims for Palestine (AMP). A lawsuit filed in a Chicago federal court in May alleged that AMP and several of its activists are "alter egos and/or successors" of a Hamas-support network that was held liable for the death of an American teen by Hamas terrorists in 1996. A 2015 IPT investigation first detailed connections between AMP leaders, including Abu-Irshaid, and a former pro-Hamas network in the U.S. called the "Palestine Committee." Foundation for the Defense of Democracies Vice President Jonathan Schanzer built on those connections in Congressional testimony last year. Abu-Irshaid has defended Hamas leaders and openly supports the terrorist group in social media posts. After the U.S. State Department designated Hamas activist Ahmed Ghandour as a terrorist in April, Abu-Irshaid blasted the move as "an extension of the old/new US policy against Hamas, adopted [by President Bill Clinton, then] by former President George W. Bush, followed by Barack Obama and Donald Trump today ... But the fact that the Trump administration is adding specific names from Hamas is a clear display of good intentions toward Israel. This shows a contradiction between US policy and European [policy] toward Hamas, especially since some European parties, such as the European Court of Justice [ECJ], have [recommended] taking Hamas off [the European Union's] terror blacklist since 2003." Khalil Jahshan, a Palestinian American who is executive director of ACRPS' U.S. affiliate, the Arab Center Washington DC (ACW), also spoke at the Doha Institute's Tunis conference. He called for a reassessment of boycott tactics in response to the Israeli government's pushback as "vital to ensuring the sustainability and continued effectiveness of boycott campaigns across the world." "It won't be enough to repeatedly shout that Israel is incapable of defeating the worldwide BDS movement ... [the campaign] needs to capitalize on its efforts," Jahshan said. At a March conference on the "The Israel Lobby and American Policy" sponsored by the virulently anti-Israel Washington Report on Middle East Affairs (WRMEA), Jahshan claimed that BDS is "beginning to have an impact," adding that "...today it is not accidental that the prime minister of Israel and most of its national security leaders view the BDS as the number one national security threat to the state of Israel, because it's exposing it worldwide, in no uncertain terms, to the fact that occupation has got to end, occupation cannot be tolerated. The more clarity there is associated with that, I think, the more effective the campaign would be and the more attractive it would become, particularly here in the U.S."
ACRPS' senior leadership has ties to terrorist groups, including al-Qaida, Hamas, and Hizballah. Qatari national Abdel Rahmanal-Nuaimi, who was appointed the center's president in 2002, was designated by the U.S. Treasury Department in 2013. A Treasury press release announcing the designation called him a "terrorist financier and facilitator who has provided money and material support and conveyed communications to al-Qa'ida and its affiliates in Syria, Iraq, Somalia and Yemen for more than a decade." That action includes ordering "the transfer of nearly $600,000 to al-Qa'ida." The center has featured top-ranking Hamas activists at its conferences. Former Hamas leader Khalid Meshaal spoke in 2012 about "The Islamist Movement and the Path to Governance in Complex Circumstances: Lessons Learned from the Hamas Experience." Another noted Islamist leader invited to speak at the event was Sheikh Rachid Ghannouchi, the head of the Tunisian Ennahda Party. At the ARCPS' second annual conference the following year, Hamas' head of international relations, Osama Hamdan, spoke on "Resistance: the Options and the Future." ARCPS is reportedly funded by the Qatari government and its events feature the Qatari leadership. Azmi Bishara, a former Arab member of Israel's parliament currently serves as ACRPS' general director. Bishara reportedly aided the Iranian proxy group Hizballah during the 2006 Lebanon War by warning about a prospective Israeli attack on its leader Hassan Nasrallah and by advising on how to engage in "psychological warfare" against the Israelis. Bishara gave the keynote speech via video at an October 2016 conference on democracy in the Arab world at ACW, the Arab Center's D.C. affiliate. In February 2014, ACW board member Mohammed Abu-Nimer, participated in a panel with Ramah Kudaimi from the U.S. Campaign to End the Israeli Occupation (now known as the U.S. Campaign for Palestinian Rights) to advance the false narrative of Israeli apartheid and the Boycott, Divestment, and Sanctions global campaign. The event at American University was sponsored by the American University Students for Justice in Palestine, a radical student organization that has chapters on several campuses across the U.S. and campaigns for divestment from Israel, which falsely smears as an apartheid state. Kudaimi has advocated terrorism, calling it "resistance," and defended a convicted terrorist bomber. "[T]he real resistance is in the streets of #Palestine fighting Zionist regime," he wrote in an October 2015 Twitter posting. "[T]he fake resistance is killing Syrians doing their own intifada." In a March op-ed, Kudaimi argued that convicted Palestinian terrorist Rasmieh Odeh – who participated in a 1969 Jerusalem grocery store bombing that killed two Israeli college students, "should be honored, not imprisoned." Yousef Munayyer, a non-resident Middle East analyst at ACW, also serves as the executive director of the US Campaign for Palestinian Rights. In an American Prospect article in support of BDS, Munayyer wrote: "...full BDS can grow and create a reality of political, economic, and cultural isolation that will show the Israeli public their leaders have misled them. Additionally, while the boycott of settlement goods has an impact and should be encouraged, it is marginal on its own when compared to the amount of pressure that will likely be necessary to change Israeli behavior." Nadim Rouhana, who is on ACW's board of directors, is founding director of Mada al-Carmel—Arab Center for Applied Social Research, an anti-Israel organization that routinely hosts conferences and other events on topics related to Zionism and "Settler Colonialism." Arab states at odds with Qatar are unhappy with its support for the Muslim Brotherhood, which they see as a terrorist threat, and for Qatar's destabilizing influence in the region. But its support for BDS is equally immoral and unfavorable to Middle East peace efforts. By providing a platform to anti-Israel and pro-BDS propaganda, Qatar propagates a slanted and one-sided Palestinian narrative that perpetuates Israeli stereotypes and pins the blame for the current impasse in negotiations entirely on the Jewish state.